At approximately 7:15 p.m. on the stormy night of 28 December 1879, the central navigation spans of the Tay bridge collapsed into the Firth of Tay at Dundee, taking with them a train, 6 carriages and 75 souls to their fate. The disaster is one of the most famous bridge failures and to date it is still one of the worst structural engineering failures in the British Isles. Detailed accounts of the disaster are given by Prebble(1) and Thomas(2). A fully revised new edition of David Swinfen's(3) book on the disaster has just been published. The book, utilising recent research, addresses the questions: What caused the disaster and who was to blame. In addition, it examines the question of how many lives were lost. 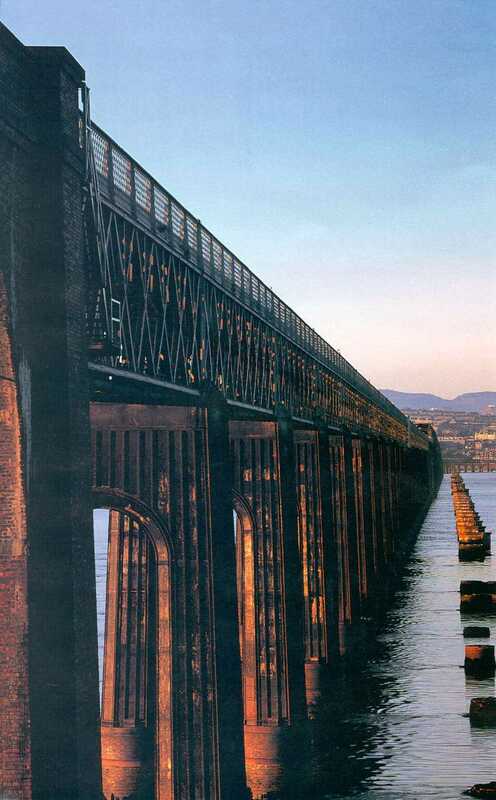 The Tay bridge was nearly two miles long, consisting of 85 spans and at the time was the longest bridge in the world. The spans carried a single rail track; 72 of these were supported on spanning girders below the level of the track; the remaining 13 navigation spans were spanning girders above the level of the track (i.e. the train runs through a tunnel of girders). These "high girders", as they were known, were 27 ft high with an 88 ft clearance above the high water mark. It was these spans which fell. Most of the girders below track level, all of which remained standing, were transferred to the present Tay rail bridge(7). At the time of the collapse Bouch was working on the design of the proposed Forth Bridge. In consequence, the design of the bridge was transferred to Benjamin Baker and Sir John Fowler. A Court of Inquiry was set up to try and ascertain the reason for the collapse of the bridge. The Court of Inquiry report (8) concluded that, "The fall of the bridge was occasioned by the insufficiency of the cross bracing and its fastenings to sustain the force of the gale." The Court of Inquiry indicated that if the piers, and in particular the wind bracing, had been properly constructed and maintained, the bridge could have withstood the storm that night, albeit with a low factor of safety - 4 to 5 was the norm at the time. Apart from the results of the original Court of Inquiry, various theories have been put proposed to explain the collapse. 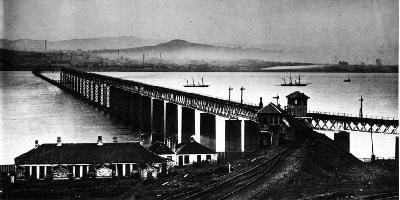 The picture shows the present Tay Rail bridge alongside the pier remains of Bouch's bridge. It is a very emotive site and provides a grim reminder of the disaster. The wrought iron girders which remained standing after the disaster were transferred onto the present bridge where they are still in use today. Researching the Tay bridge disaster has taken place over a period of 18 years resulting in 4 joint papers being published, three of which are available for download from the References section below. For further information, please contact Tom Martin. 1. Prebble J. (1979) The High Girders. Penguin. 2. Thomas J. (1970) The Tay Bridge Disaster David and Charles, Newton Abbot. 3. Swinfen D. (2016) The fall of the Tay Bridge, Birlinn Ltd.
4. Martin T. J. & MacLeod I. A. (1990) The Tay Bridge Disaster - a study in structural pathology, Developments in Structural Engineering, Forth Rail Bridge Centenary Conference, Spon. 9. Court of Inquiry (1880) Report upon the circumstances attending the fall of a portion of the Tay Bridge. 10. Dow W. M. (1979) 'Destined for disaster', Scots Magazine, 275-186. 11. Lewis R. P. & Reynolds K. (2002) Forensic Engineering: A Reappraisal of the Tay Bridge Disaster, reinvestigating the Tay Bridge disaster of 1879, Interdisciplinary Science Reviews, Vol 27, no 4. 12. Lewis R. P. (2004) Tempus Publishing, Beautiful railway bridge of the silvery Tay. Reinvestigating the Tay Bridge disaster of 1879. 13. McKean C. (2006) Granta publications, Battle for the North, The Tay and Forth Bridges and the 19th -Century Railway Wars. 14. Burt P. J. A. (2004) The great storm and the fall of the First Tay Bridge, Weather, Vol 59, no 12. 17. Rapley J. (2007), Tempus Publishing, Thomas Bouch, the builder of the Tay Bridge. 18. Gren Andre (2006) Siver Link Publishing, The Bridge is Down: The Tay Bridge Disaster of 1879 as Reported in transcripts of the Public Enquiry. 19. Lumley Robin (2013) The History Press. Tay Bridge Disaster: The People's Story. Permission to reproduce the paper: Martin T. J & MacLeod I. A. The Tay rail bridge disaster - A reappraisal based on modern analysis methods, Proc. Instn Civ. Engrs, 1995 ,108, 77-83 in PDF format from the Institution of Civil Engineers is gratefully acknowledged. Permission to reproduce the paper: Martin T. J & MacLeod I. A. The Tay rail bridge disaster revisited, Proc. Instn Civ. Engrs, 2004 ,157, 187-192 in PDF format from the Institution of Civil Engineers is gratefully acknowledged. Permission to reproduce a pier image (showing uplift) from the Dundee City Council, Central Library, Photographic Collection is gratefully acknowledged.